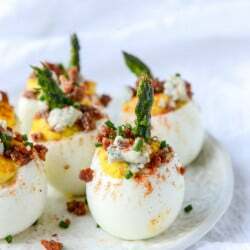 this classic egg salad with bacon. YES. these everything bagel cheese twists. dead. this carrot cake horchata. WHAT. these green smoothie bowl. amazing. this toffee crunch cheesecake. eeeeek. these overnight black sesame buttermilk rolls. incredible. this skillet banana crumb cake. yep yep. these watercolor easter egg cookies. stunning. this rhubarb apple pie. gorgeous. this monte cristo breakfast casserole. wow. this perfect pina colada. need. this tomato soup with feta and bacon. whoa. this creamy vegan corn chowder. love. this raspberry rhubarb tart. pretty. these beautiful stuffed artichokes. adore. this peeps chocolate pie! dreamy. this adorable DIY french baby shower. so cute. these raspberry chamomile cream sodas. delicious. this dairy free chocolate mousse. looks SO good. this black sesame mochi ice cream. just check that out. That Pina Colada recipe might be exactly what I need this weekend! THE EVERYTHING BAGEL CHEESE TWISTS. SO MANY HEART EYE EMOJIS! These are all great links, thanks for sharing! I am so into Champagne cocktails right now. I will have to try the Mojito one. My current favorite is blush champagne with St. Germain and lime. SO good. We also did a Champagne Margarita for a bridal shower recently, and just wow. I am thinking about making a variation of that with pureed peaches, tequila, lime, and champagne and a black lava salt rim. I can already envision how beautiful it will be. Thanks so much for including my Monte Cristo Casserole! It was so great to meet you last weekend, you’re absolutely the sweetest! And your little man, gah! Have a great Easter! Oh crumbs. I want to cook all of these. Immediately. All of these pics look amazing! I so want to try the skillet banana crumb cake and those everything bagel twists. And btw those glitter eggs are adorable! So many delights! I totally want to get my hands on some rhubarb and make that tart ASAP. And then it might be both dessert and breakfast. I’m just saying. I have been craving banana cake. That is just the one I need. I’ve been craving that rhubarb tart ever since Heather posted it!!!! And i tried my hardest to find fresh rhubarb today, and alas, none could be found. This list and those glitter eggs + Emilie’s stuffed artichokes, xo xo xo !!! Oh my, that everything bagel twist!!! Those watercolor egg cookies are gorgeous too.